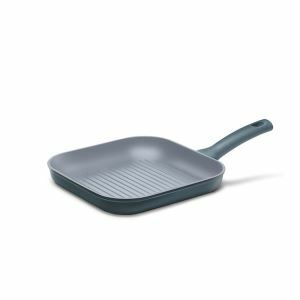 The Cuisinox grill pan for cooking delicious meat, fish, vegetables and more using less oil for healthy cooking. Enjoy perfect grilled food every time with little effort. Heat, stain and scratch resistance. Cooking surface 26 x 26cm. Optimal heat distribution, energy efficiency. Ergonomically shaped heat insulating handles. Suitable for alle heat sources, including induction. Grooves in the grill pan collect grease and create grilling stripes.